GlobalFlyer pilot Steve Fossett successfully landed at Salina Municipal Airport in Kansas at 2:45 p.m. Eastern time Thursday, becoming the first pilot to fly solo, nonstop around the world without refueling. "On behalf of more than 400,000 fellow pilots and AOPA members, I´d like to congratulate Steve Fossett and the entire GlobalFlyer team on their remarkable achievement," said AOPA President Phil Boyer. Virgin Atlantic, the company that sponsored Fossett, said his around-the-world trip has been recognized by Guinness World Records; however, it still needs to be accepted by the National Aeronautic Association. 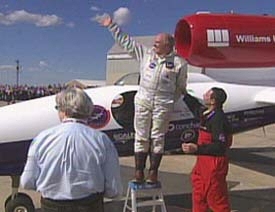 Fossett and the Virgin Atlantic GlobalFlyer team persevered through two obstacles that threatened the record-setting attempt. Fossett began experiencing problems with the aircraft´s GPS as he was crossing into Canada. Failure of the GPS would have forced Fossett to fly "blind" and rely on reports from mission control. Then mission control discovered a discrepancy of 2,600 pounds in readings between the fuel burn and probes in the aircraft, and it was uncertain whether he had enough fuel to complete the flight. Fossett and mission control decided Wednesday night to continue the attempt. The successful transfer of fuel from the wing tanks to the main booms allowed mission control to accurately measure the amount of fuel on board and increased hopes that Fossett could finish the flight. Favorable tailwinds also helped to keep the goal within reach. Virgin Atlantic reported that Fossett needed at least 58-knot tailwinds. While crossing the Pacific Ocean, he enjoyed tailwinds greater than 130 kt.